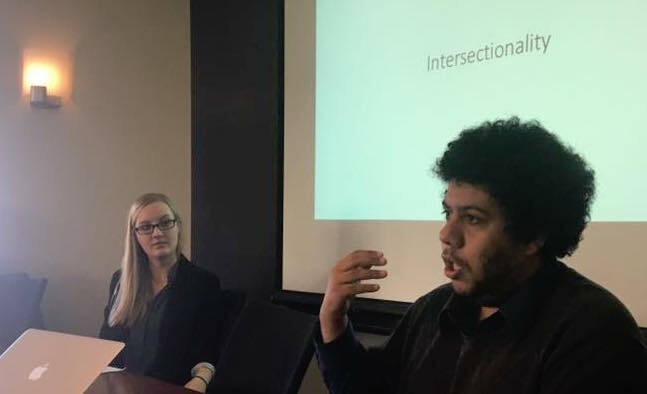 Liam Kofi Bright and I presenting about intersectionality, participation grades, and inclusive pedagogy at Princeton's MAP chapter's conference on implicit bias/stereotype threat and pedagogy. ​Students in the philosophy classroom practice skills useful for reflecting upon ethical, societal, and epistemological questions that arise in their own lives and among their social groups. To promote the traits indicative of a self-reflective and life-long learner, I aim to (i) develop students’ autonomy in their own learning process while still providing instruction that incrementally builds the necessary skills (ii) create a classroom that values transparency in disciplinary norms, and (iii) promote a mindset that learning is achieved through hard work and flexibility of strategies. My classroom is focused on learning—a focus that promotes inclusivity as it highlights the diversity among students in the classroom—as a process to be developed and practiced throughout their lives regardless of career path. Through the assignments and readings in my course, I encourage students to self-direct their own learning while my instructional activities and assignments provide low-stakes opportunities to practice their newly acquired skills. I also provide students with feedback frequently with an eye toward how the individual student might make the most improvement. In my course on philosophy of race and racism, I asked students to choose the topic for their history of science podcast from a list of pre-approved topics such as historical concepts of race, the history of racial differences in intelligence research, and other possible topics. For their next major assignment, I asked students to exercise their autonomy and write a proposal for their paper topic related to philosophical issues concerning either race or racism. When students are encouraged to pursue project on topics of their own choosing, they are better able to see the connections between the philosophical issues and their own interests. I provided students with feedback on their chosen topics, including potential issues they may run into when writing their papers and strategies for narrowing their scope. This autonomy in choosing paper topics is especially important for courses where the majority of students enrolled because the course discussed race, not because it was a philosophy course. Then throughout the next few weeks, students are asked to slowly work on their paper through a series of paper-building assignments. First, students are asked to submit a brief annotated bibliography, then a thesis statement, an outline, and finally their paper draft. At each point in these assignments, students are given feedback on their progress and tips for working on the next step. The last major assignment was the creative project in which students had autonomy over both the topic and the form (e.g., board game, podcast, video game) of their project. Early in the semester, students met with me individually and brought a proposal that included the proposed topic of their creative project, a breakdown of the tasks they’d need to do to complete the project, and an explanation of how their project will answer one of the required prompts. By asking students to plan before meeting with me, they were better able to articulate their intended project and estimate how to complete it in a timely manner. I also asked students to consider a contingency plan if their original plan did not go as intended, such as a student who planned to create a video game and another student who planned to draw a series of portraits. Through scaffolded long-term assignments, my students develop the skills to complete student-led projects and meet a deadline within the setting of academia and beyond. Many students walk into my classroom having never taken a philosophy course before. I strive to make the norms of philosophical reading and philosophical writing explicit for all of my students. While students may have absorbed the norms of disciplines like mathematics or literature (seemingly by osmosis), the unique nature of analytical, deep-textual reading present in philosophy classrooms can be initially off-putting to some students. When beginning a class discussion about a difficult philosophical text, I check in with my students about their struggles with the text by asking about their experiences completing the reading. At this opportunity, students often mention that they find the author has used too much jargon or that the author contradicts themselves. The latter response indicates a misunderstanding of the norms of argumentative texts; this misunderstanding can occur when students view the texts as merely informational and see the role of the learner as primarily an information-receiver. I use students’ responses to address these potential misunderstandings with the class. I also ask more advanced students to provide tips for those new to reading philosophical texts, such as how to identify views the author endorses and distinguish those from ideas with which the author disagrees. Making the norms of philosophical texts and the norms of writing an argument explicit becomes even more important in interdisciplinary courses. Courses in the history and philosophy of science often involve introducing students to both philosophical and historical methods of analyzing scientific practice. In my course on philosophy of race, I contrasted the two basic approaches in philosophy and history while pointing out commonalities: historical writing involves providing an argument for a particular interpretation using evidence from historical sources; philosophical writing involves providing an argument for a particular position using reasons and evidence from the relevant domains. For most students, my course is one of the first philosophy courses they will take and in many cases, it will be one of the only ones. Often students who perform well in their science or English literature courses will receive a worse grade than they expected on their philosophy paper. As an instructor, it seems natural that many students writing a philosophy paper for the first time will not yet have mastered the skills for defending their own position clearly. However, the disparity in expected grades and earned grades on philosophy papers can discourage students and lead them to think that they are not cut out for philosophy. On my view, this fixed mindset about philosophical skills is incorrect and counter-productive to learning. I strive to cultivate a growth mindset about success in philosophy among my students so that they view philosophical skills as developed through practice and failures are seen as a chance to reflect upon their learning strategy and alternative strategies. I use philosophy paper revisions as one way to inculcate these ideas in my students. This revision opportunity conveys the message that philosophical skills require practice just like any other skill. It also gives me the chance to speak to students who are revising their paper; I ask students to complete a worksheet reflecting on their response to my feedback as well as the two most important pieces of feedback provided on their paper draft before coming to see me at office hours. We talk about their paper by looking forward to different strategies for writing an improved paper draft. I find that students in these meetings not only recognize why their current paper draft received the grade that it did, but they also reflect upon my feedback and think about ways to improve their paper. Lastly, because the paper revision is due in lieu of a final exam at the end of term, it can refocus students who have pressing external goals for receiving a particular grade in the class to focus on the courses’ learning goals and improving their skills to earn their desired grade. In addition to the paper revisions, I also allow students to submit more weekly reflection responses than count towards their grades. These low stakes assignments allow students to practice the skills needed for the philosophy paper without worrying too much about their grades. This practice promotes that idea that learning new skills and improving existing skills takes practice, regular feedback, and revision or refinement of learning strategies. Required self-reflection upon a students’ progress in learning a set of skills is also built into my assessment of each students’ participation. Students are assessed formally for their participation by a brief paper that they write reflecting upon their own participation throughout the course, through different modes (e.g., discussing course texts with roommates outside of class, talking to the instructor via email or during office hours), and by evaluating how their participation contributed to (or detracted from) their learning in the course. This assignment promotes the idea that consistent engagement with course content and texts is required for success, but that much of learning can happen outside of the classroom. Ideally, the conversations started during the course will continue in students’ lives outside of the course. As they practice the analytical and reflective skills emphasized in my courses throughout their daily lives, they will (hopefully) continue to improve these skills. All of my instructional strategies are designed to develop students into self-reflective and life-long learners. My course goals include overcoming barriers to their own success—such as believing one cannot improve their skills or failing to recognize and make us of different disciplinary norms. I require students to set their own learning goals according to their interests and values while supporting students in practicing strategies for self-directed projects. Stephen Bloch-Schulman and Nora Boyd actively reflecting on pedagogical choices during the AAPT one-day workshop on Inclusive Pedagogy (organized by me, Stephen Bloch-Schulman, Kevin Hermberg, Melissa Jacquart, and Nora Boyd. I also help my peers in Pittsburgh reflect upon their own teaching strategies and how to incorporate inclusive practices in future courses. I have also been invited to co-lead (with Liam Kofi Bright) the inclusive pedagogy session of the graduate student instructor training courses for both the University of Pittsburgh Department of Philosophy (Fall 2014, 2015, 2016, 2017, 2018) and the University of Pittsburgh Department of History and Philosophy of Science (Spring 2016, 2017, 2018, 2019). In these sessions we cover how to improve minorities’ and women’s sense of belonging in the classroom, why and how to diversify course syllabi, why and how to anonymize grading, and among other topics. 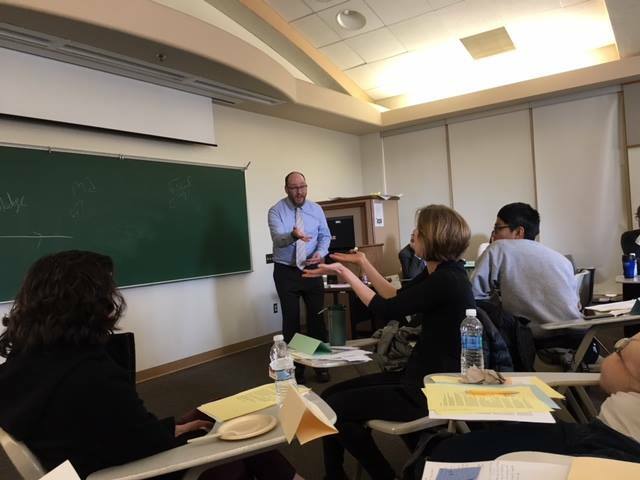 I have also served as a local organizer (with Nora Boyd) for the American Association of Philosophy Teacher one-day workshop at Pitt, which focused on inclusive pedagogy. Nora and I organized all financial and hosting aspects of the workshop as well as conferencing with the facilitators about pedagogical methods demonstrated through their sessions. For academic year 2017-2018, I have been selected by the HPS faculty to serve as the HPS TF/TA Mentor. In addition to sharing my work and resources in inclusive pedagogy with the Pittsburgh community, I have created a number of resources for the wider philosophical community on inclusive pedagogy. I helped create the Best Practices for the Inclusive Philosophy Classroom website for the Minorities and Philosophy (MAP) organization. Specifically, I reviewed empirical research on the underrepresentation of students in philosophy and other disciplines to provide an annotated bibliography on the "Empirical Research" page, which you can find here: http://phildiversity.weebly.com. Another resource I created, a handout for improving the philosophy classroom climate for underrepresented groups, can be found here (links to my academia.edu page). I also teach other philosophers about best inclusive practices based on my own research and research from other disciplines. I have been invited to present on these topics at the University of North Carolina’s Workshop on the Recruitment and Retention of Female Undergraduates in Philosophy (April 2014) and at the Minorities and Philosophy chapter at Princeton University’s Conference on Implicit Bias/Stereotype Threat and Pedagogy (October 2016). For example, at Princeton I led a discussion on aligning course goals, assessment of student participation, and inclusivity concerns. I argued that the traditional method of marking participation for quantity and quality of in-class comments is often not well aligned with course goals and may conflict with goals of inclusivity. Instead, I argued that if instructors’ course goals are to cultivate engagement and thoughtfulness about course content, a better assessment of learning would give credit for students’ written and out-of-class participation too.